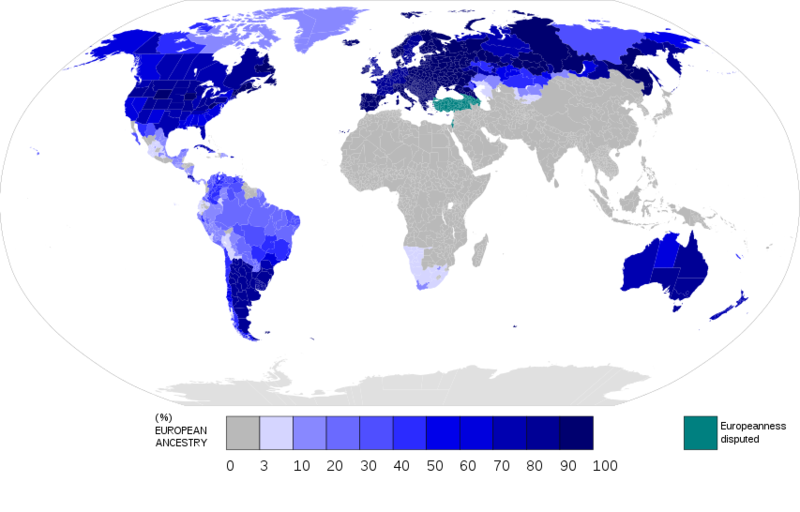 The map above shows the percentage of each country’s population that has some claim to European ancestry. Taken together, it could be argued that Europeans are the world’s largest diaspora, with an estimated population of over 480 million people. However, just what constitutes European ancestry is highly controversial. The map excludes Turks and Azerbaijanis from being Europeans, but includes Georgians and Armenians. While this may be because the former are Muslim and the latter are Christians this is not wholly satisfying due to the fact that Balkan Muslims are considered European. USA census. Russian census by oblast, autonomous provinces and other subnational entities linked in the Russian Wikipedia. Ethnic census in Central Asia, Australia states/territories, Latin American and Southern African countries quoted in articles in Wikipedia. Non-european immigrants population recounts in Europe in different articles. 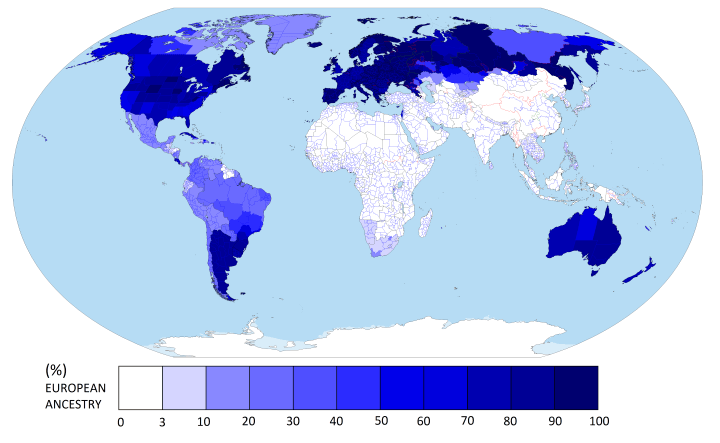 Therefore, based on most national censuses, many mixed race people would also be excluded from the map above and the data below. Turks and Azeris are a recent conquerer population that migrated from central Asia, and the founders unrelated in any relevant sense to the Anatolian populations from before about 1000 years ago. Armenians and Georgians have been there since antiquity, and in addition to religion similarities, culturally, linguistically, phenotypically are more like the Slavs and other European groups to their north and west than the Semitic groups south or Turkic groups east. Whereas the Bosnians, though yes Muslim, are Slavic, culturally like their neighbors, phenotypically like their neighbors, geographically disjunct from the larger Muslim community, and converted from the religion of the Romans. Also mind where they’re integrated. Armenian and Georgia are on Russia’s energy and material grids, Turkey’s largely its own but is better integrated with the middle east’s, even if it’s also connected to the EU via Greece. But mostly it’s also just reasonless self-identity – the Armenians, Bosnians and Georgians consider themselves European, the Turks are proudly Asiatic. That said, there’s been considerable mixing on all fronts. And it’s largely superficial stuff anyways. It’s notable though that average skin tone means Armenians and Georgians can typically pass for white, at least where I am.